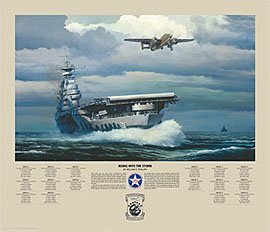 Image Size: 24" x 15 1/2"
Paper Size: 27" x 23 1/2"
Prints are counter-signed by up to FIVE (5) surviving Doolittle Raiders. (See below) Signing will take place during the 70th reunion in Ohio. 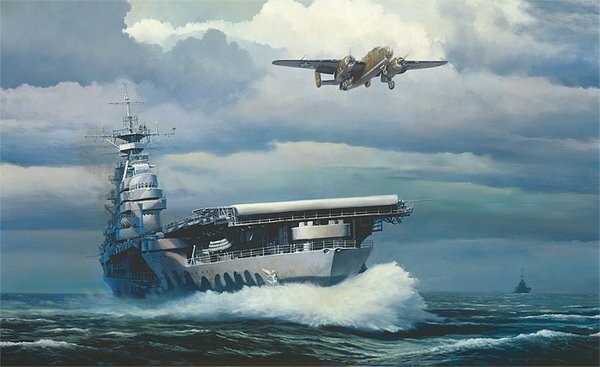 William S. Phillips’ Rising Into the Storm places us just off the bow of the Hornet seconds after Doolittle’s B-25 has left the deck. The atmosphere moments before had been tense. While two test take-offs from the ship had been performed months earlier off Norfolk, VA, those aircraft were not fully laden with fuel, bombs and crew. Throttles at full power, flaps down and his B-25 straining against its brakes, the plane rattled and roared as Doolittle waited for the release from the flag man. At his side sat Lt. Richard E. Cole, his co-pilot and one of the co-signers of the 70th Anniversary Commemorative Editions of Rising Into the Storm. Time has been kind and granted you the opportunity to own an authentic piece of Doolittle Raider history. These editions, beautiful works of art unto themselves, become historical documents when signed by the actual Raiders attending their 70th reunion in Dayton, OH.